For this reason, we have compared the training stats produced under LRH with those today. Wherever possible, we have scanned the original publications which feature these stats so the reader can see them for himself. 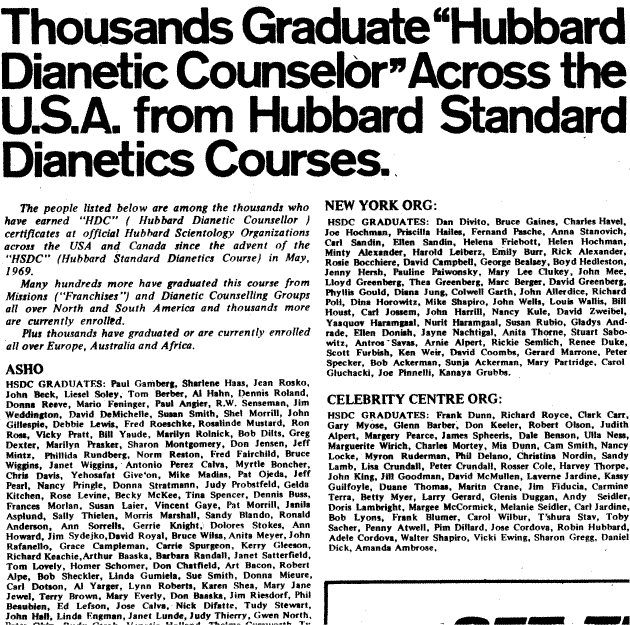 In early 1971, ASHOs The Auditor magazine, Issue 61, listed the total number of Scientologists who had trained on the Hubbard Standard Dianetics Course (HSDC). 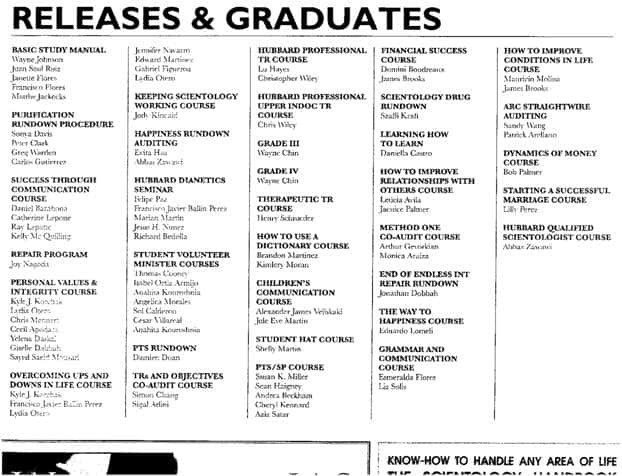 This list includes graduates from the course’s initial release in May 1969 to the publication of this magazine less than 2 years later. The number of NED comps for 2006-08 varied slightly from 2004-05, but averaged out roughly the same. Compared to the figures from mid-1969 to early 1971, this represents a decline of 95 to 100%. 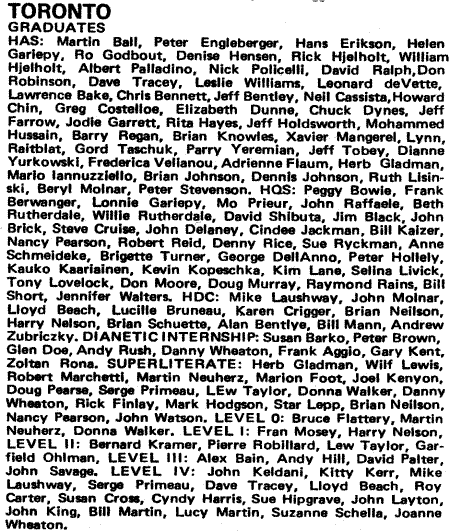 We have scanned the lists of Levels 0-IV completions from around the country from 2 different issues of The Auditor picked at random from the 1970s. 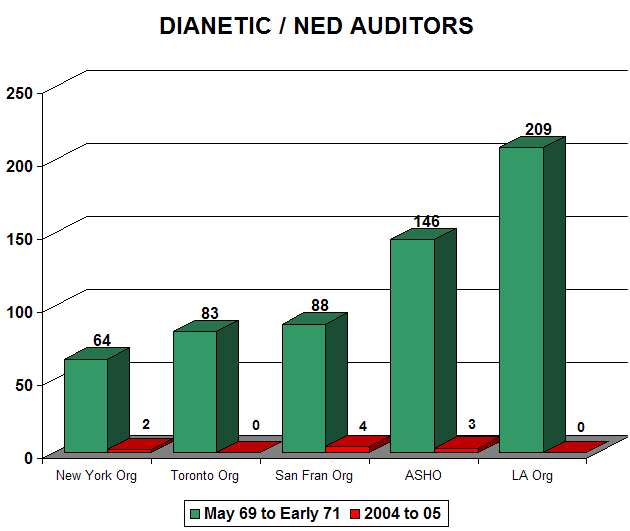 Below are two sections (Founding Church of Washington, D.C. and Toronto) from The Auditor Issue 90. 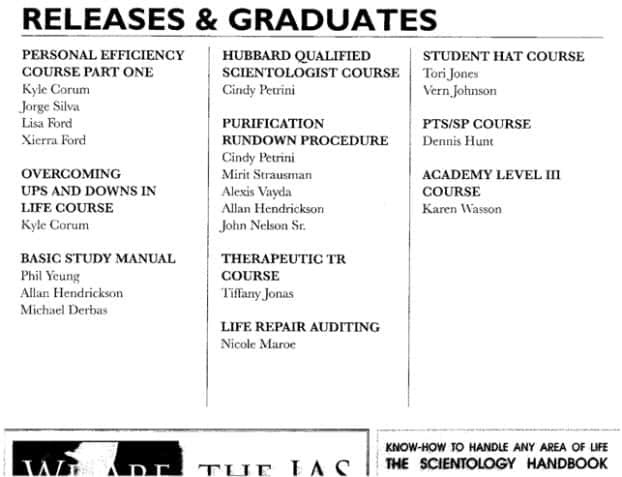 Note: In addition to the Academy Levels other courses listed include HAS (Hubbard Apprentice Scientologist — TRs 0 - IV), HQS (Hubbard Qualified Scientologist), HDC (Hubbard Dianetics Course), Superliterate (product of the Primary Rundown — word clearing & study tech), and Internships. Click here to see the completions for St. Louis, Boston, Celebrity Centre, Twin Cities (Minneapolis), San Francisco and Miami — all from this same issue. 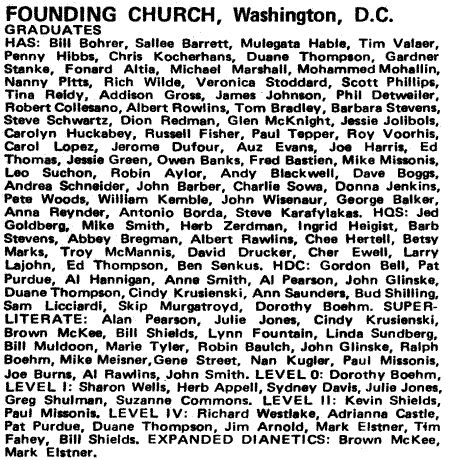 We have also scanned the completions of the Founding Church (Washington, D.C.), San Francisco, St. Louis, Celebrity Centre, Honolulu, and Toronto from The Auditor Issue 94. Monthly Academy Level completions from these same orgs over the past few years, on the other hand, average between 0 and 1, as seen in “Current Completions” below. This is a drop of 85 to 100%. 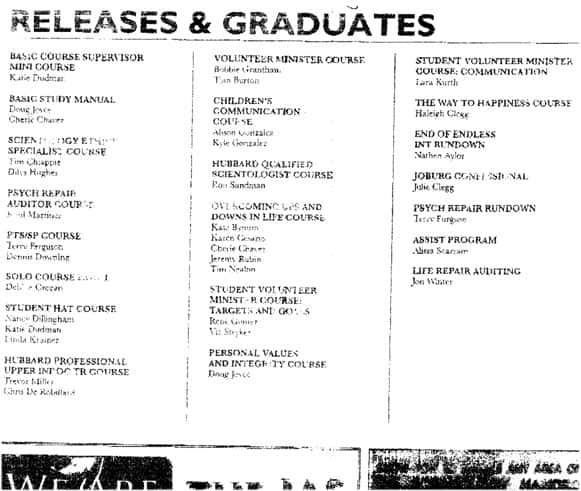 Issues of The Auditor from the early 1970s show an average of 7 to 9 ASHO Briefing Course graduates a month, or roughly 100 per year. The only yearly compilation available was from 1976. This is an average of 2 new Class VIs per week. From 2005 to mid-2007, new Class VIs ranged a bit higher, and then went back down after the release of the Basics. Compared to the 107 Class VIs made in 1976, these current years represents a decline of 80 to 95%. 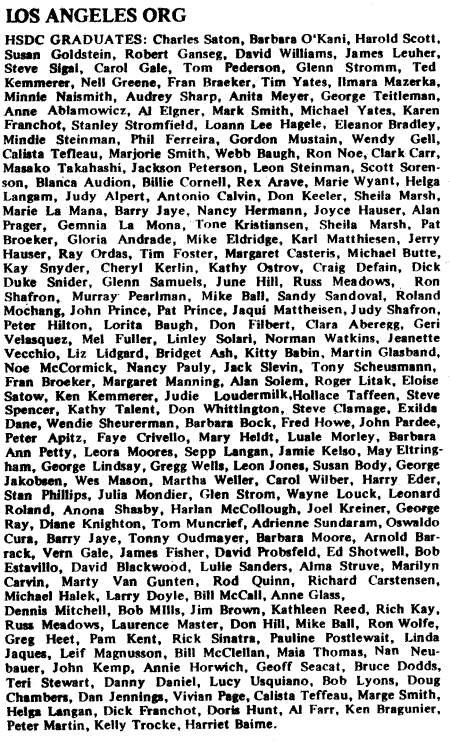 In April 1974, The Auditor published a list of Class VIIIs made in the West U.S. since the release of the course in September 1968. This is just under one new Class VIII per week over a 5½-year period. 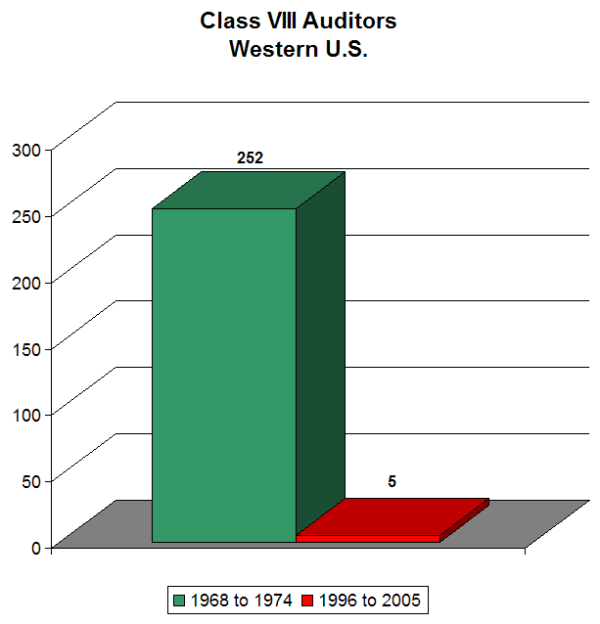 Contrast the above with the number of Class VIII auditors produced in the West U.S. between 1996 (when the Golden Age of Tech was released) and 2005. This is an average of 1 Class VIII made every 2 years. Compared to the average of 1 Class VIII made every week in the late 1960s and early '70s, this is a crash of over 99%. 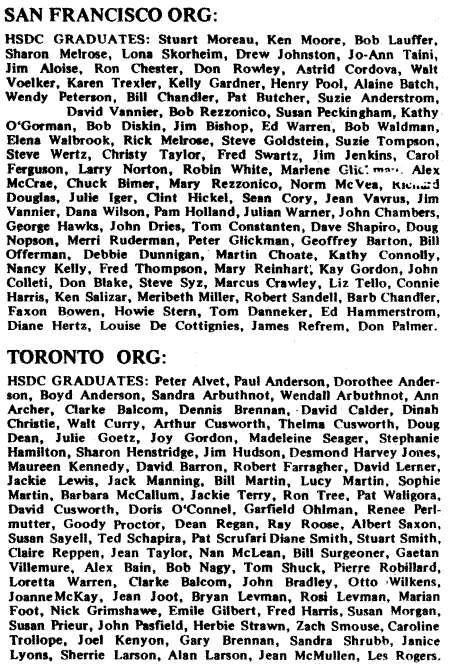 In this section, we compare monthly completions of individual orgs from the early 1970s with completions from those same orgs today. St. Louis and the Founding Church of Washington, D.C. are shown as examples. 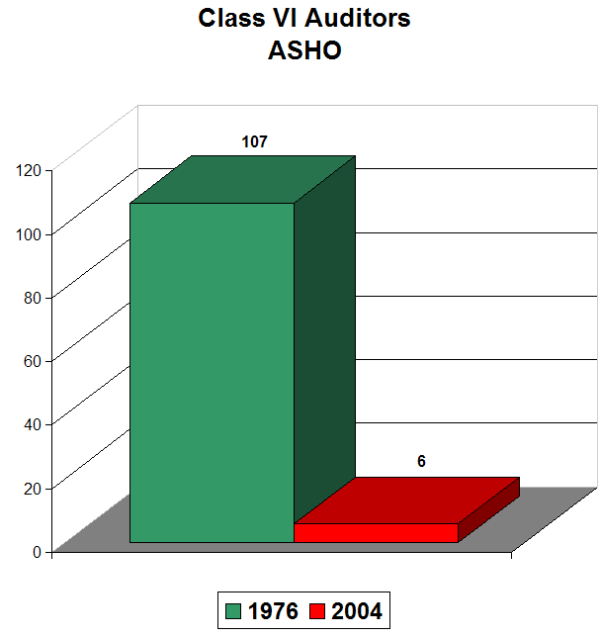 One point worth noting is that throughout the 1970s stats from ASHO's The Auditor were published every 2 months per LRH policy (LRH ED 59 INT), as were the stats in most of the individual org magazines. Current org magazines, on the other hand, often publish stats which they have accumulated over a 3 to 4 month period (sometimes 6 to 8 months) and include them in one single issue, in violation of the above policy.